Axcent Deep Purple Rockcress is a popular spring-flowering perennial. It will form a low mound of medium green foliage that remains semi-evergreen through the winter. From late spring to early summer this ground cover perennial explodes with deep purple flowers for several weeks. The flowers have a small yellow eye. It will grow to a height of 4" to 6" tall and 12" to 18" wide. 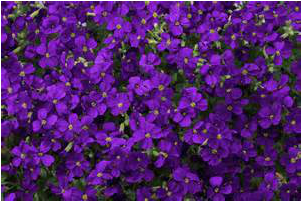 Use Axcent Deep Purple Rockcress in a rock garden, cascading over walls, as an edging plant, massed in a perennial bed, or in containers. You can even plant this on the edge of a Woodland Garden where it will get some sunlight. Trim the plants lightly immediately after blooming, to encourage a full, thick mounding habit. Axcent Deep Purple Rockcress is deer resistant and is also a Firewise plant.